← Wrenshall, Minnesota. May 25th, 2013. Dalkey’s Bullock Harbour, Ireland. May 25th, 2013. A four-year-old girl is lucky to be alive after the ground opened up and swallowed her at Dalkey’s Bullock harbour. The child was walking with her pregnant mother at the harbour when the sinkhole opened beneath her. The girl screamed as she disappeared– a witness said she was lucky to have caught her arm on a length of plastic ducting or she could have fallen further. 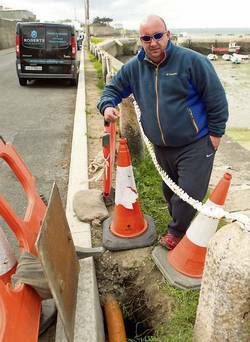 Local man Wayne Farrell said he was working on the slipway of the harbour on Tuesday evening when he heard a woman calling for help. “It was only when I got up to her that I realised what had happened. She said her daughter had fallen down a hole, and then I saw her down in the ground behind the harbour wall,” he told Herald. “The ground behind the harbour wall seems to be getting washed away by the tide when it comes in and it has created big cavities in the ground, and this little girl was lucky not to be killed when the ground beneath her feet suddenly collapsed,” he added. 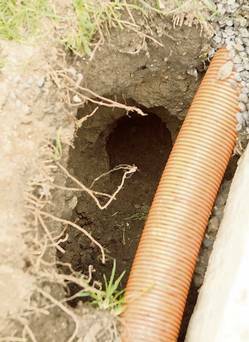 “The woman was very shaken by the whole thing, and her daughter got a terrible fright, but thankfully because she got caught on the ducting as she fell, she didn’t disappear deeper into the hole,” Mr Farrell said. “If the girl had slipped down further she would have been wedged beyond rescue,” Mr Farrell said. Dublin Port, which has responsibility for the area, said the situation is under investigation. “The area where the incident happened safe by covering it and putting a cordon around it, and further inspection work is due to take place in the coming days,” said a port spokesman. Sources said fixing the problem could be “a major engineering project”. Wayne Farrell, who works at the harbour, said there is no mortar between the stones in the harbour wall and it appears the incoming tides are washing the ground out from behind the wall, making the area unsafe. “Something really needs to be done now or there will be more accidents,” he added. Although the girl who fell down the hole was very shaken by the incident, she was not believed to have been injured. This entry was posted in Pictures and tagged Ireland, sinkhole. Bookmark the permalink. 1 Response to Dalkey’s Bullock Harbour, Ireland. May 25th, 2013.